Katrina Day and Hannah Vaughn in The Incredible Fox Sisters. Photo by Jonno Rattman. BOTTOM LINE: A darkly funny ensemble period satire about séances, ghosts, celebrities and sisterhood brought to life by an exciting multidisciplinary production company. “There is more science yet to be tapped…” croaks a carny to a crowd of gasping gawkers. 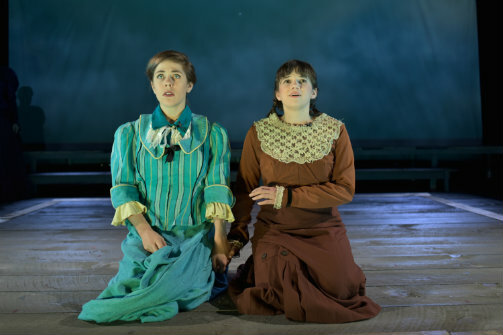 Set in the mid-1800s, The Incredible Fox Sisters, a world premiere by Jaclyn Backhaus, is a true-to-life dark comedy of two sisters from Hydesville, NY, who can speak with the spirits of the dead. Spanning nearly 50 years, the play chronicles the Foxes' rise to fame as they tour the states and beyond conducting séances. By turns heart-breaking and hilarious, The Incredible Fox Sisters is a farcical ‘old-timey’ comedy about ghosts and grieving. True to Live Source’s mission to present “design based, multidisciplinary theater,” this production is a stylistic treat. The staging is sparse with a single rectangle of paint and wooden slats serving as the playing grounds (set design is by Jonathan Cottle with Kelsey Jeffries). The nimble cast, through director Tyler Mercer’s unwavering vision, transforms this bare space into a living room, a town square, a graveyard, a doctor’s office, and even the homestead off two absolutely gosh darn adorable Quakers. Evocative and simple projections by Kate Freer play across the backdrop, filling out the stylized reality of this hey-day world with graceful minimalism. The soundscape by Beth Lake is particularly spooky and effective with a hollow rapping which announces the arrival of spirits seeming to emanate from below and above the audience, simultaneously. The period costumes by Michelle Persoff are splendid, invoking the era while simultaneously romanticizing it with meticulous, gleeful, attention to every bonnet, dress, and jewel encrusted sash. Equal parts send-up of Americana and poignant rumination on longing, The Incredible Fox Sisters is a thrilling ensemble romp that toes a tight line between jolly and jarring. The staging opens up the audience area as temporary playing arena where the cast mingle through the aisles, turning into the denizens of the dozens of communities visited by the Fox sisters on their “ghost stories” tour. I felt a bit how the members of these historic séances might have, as if we are all meddling in something that is beyond our grasp. Mercer exercises a fluid grasp over the production, punctuating punchlines with moments of menace. The cast is tirelessly funny, each playing double, triple, quadruple parts, or even more! Notable scene stealers Kate Owens and Stephen Elrod have the audience in stitches from the second they set foot on stage. As a terrifically bizarre young fan with demented pig tails bunched up like two savage bushels of blonde curls shooting out of the sides of her head, Owens plays a maniacal pre-teen in one scene and moments later transforms into the “aw you betcha” jubilant and charming Quaker, Amy Post, lovingly rubbing noses with her guffawing husband Isaac, played by Elrod. Elrod turns in stellar portrayals of James Fennimore Cooper, full of generous pomp and giddy grandness, as well as a slithering lisping ghoul Mr. Splitfoot, a ghostly apparition witnessed by the Foxes. Ghost whisperers Maggie and Kate, played by Katrina Day and Hannah Vaughn, along with their elder care-taker sister Leah, played by Phoebe Dunn, have a deep chemistry. Trapped in a world of fear and determination, the three actresses capture the fragile Foxes with a defiant air of ‘us against the world.’ Dunn delivers a fading bachelorette too aware of her matrimonial clock ticking down, her story constantly taking less and less optimistic turns. Vaughn’s Kate shows softness and forgiveness where Day’s Maggie is callouses and cautious; the sister “spirit guides” are caught in a web of publicity and a well of demand that is completely overwhelming. Vaughn and Day give unwavering performances, mining Backhaus’s script for all its timely commentary of our collective obsession with the dead and the famous. Mixing modernized intonations, replete with “whatevers,” “I dunnos” and a “yass” here or there, with an early-Americana sensibility, Backhaus creates an eclectic but genuine vernacular in her speedy script. The pace and timing is purposefully contemporary; Backhaus’s rapid fire banter feels familiar to a TV-sitcom weened audience. The stylized phrasings of The Incredible Fox Sisters however are an amalgamation of heightened sensibility, modern observations, and a self-aware flippancy. Juxtaposing the ideas of what America might have been like with the historical knowledge of what it was, Backhaus and Mercer craft an intensely delightful satire that is both send-up and make-believe. It felt strangely out of touch that the cast featured no actors of color. Considering that they’re willing to take so many historical liberties with speech patterns and design elements it seems there’s no reason for an entirely white cast. Specifically, one character is described as having a “maybe-Spanish father,” which seemed an obvious part to cast a Hispanic actor. The Incredible Fox Sisters is written by Jaclyn Backhaus and directed by Tyler Mercer. Set Design by Jonathan Cottle with Kelsey Jeffries as Associate Set Designer. Costume Design by Michelle Persoff. Light Design by Marika Kent. Sound Design by Beth Lake. Video Design by Kate Freer. Stage Managed by Jessica Kidwell. Joshua Shain is the Production Manager. The Incredible Fox Sisters features Katrina Day, Phoebe Dunn, Stephen Elrod, Shannon Haddock, Andrew Hamling, Kate Owens, Anthony Ritosa, and Hannah Vaughn.